If the name of these potatoes seems complicated and difficult for you to pronounce, you can call them by their other name: Good Sister Potatoes. Why, one might ask, would these potatoes catapult me into the realm of a good sister? Well, that is a very good question, my friend. Y’see, I made these only because my sister asked me to come up with some new side dish ideas for her. And because I had some baby potatoes to cook. And these are delicious. But let’s not discuss that now, shall we? In case you haven’t noticed, I love making desserts. You haven’t? This must be your first time here. Sure, a gal’s gotta eat, and I really do enjoy cooking, baking and desserts will always have a soft spot in my heart. But sometimes one is forced to venture out of her cozy little sugary corner of the kitchen. Or she ventures out of her own free will. Because she is simply that good a sister. Take the other day week? I lost track. My sister and I were discussing menus and food, and she mentioned that she is on the lookout for some good side dish recipes. A million options came to mind. Then it hit me. My brother-in-law wouldn’t eat any of them. So I took my potatoes and focused on the task at hand. Namely, creating a delicious side dish that is not-too-difficult to make, and not too adventurous for the palate. I have to say, I couldn’t be more thrilled with how these potatoes came out. They are kind of garlicky and I say that as a good thing and totally flavorful. Best of all, they might look impressive, but actually, they are quite simple to make. So go ahead and make these Good Sister Potatoes. Don’t, however, eat them before a date or business meeting. Boil the potatoes in salted water until just tender. Drain and set aside. While potatoes are boiling, mince the garlic and shallots to form small pieces. Add to small bowl, then add olive oil, salt, parsley and pepper. Stir. Mixture will form a kind of loose paste. Line a baking tray with parchment paper. Place potatoes on tray. Place another sheet of baking paper on top. Take a similar sized tray and press down lightly on top of the upper piece of parchment paper. You will feel the potatoes smash under the tray. Don’t press too hard or the potatoes will be too flat! Remove top piece of parchment paper. Top each potato with a spoonful of the garlic mixture. Bake at 425 for 25-30 minutes, or until topping is lightly brown and potatoes appear crisp. These look really pretty! What a great side dish! I was wondering why they were called “smashed” and not “mashed” but one look at the picture gave me all the info I needed! We just had these potatoes last night and I was wondering what exciting thing I can do with them, but I did not know your recipe at the time. Instead we had simple baked potatoes. I adore potatoes. I adore onions. These photos just proved to me that something is missing in my life. These look wonderful! I don’t cook enough side dishes. Problem with cooking for one most of the time. But I need to make an excuse for these lovelies. Oh my, these look wonderful and I be the aroma is enough to drive you crazy while they bake! I am also posting potatoes today, a different version, but I guess we are thinking alike! Thanks for this yummy recipe! Yum!! Would the result be similar enough if I used non-red potatoes? I would assume other baby potatoes would work, but big potatoes probably wouldn’t get the same amazing result. My menu for next Friday night was ribs and garlic chicken and now I think I have to make these potatoes. Thanks! I LOVE THESE. Period. I’ve always loved the concept of smashed potatoes but they somehow always seemed complicated. These look amazing, and easy to do. These would go great with a roasted meat with jus of some sort. The gravy and crispy potatoes sound so yum! 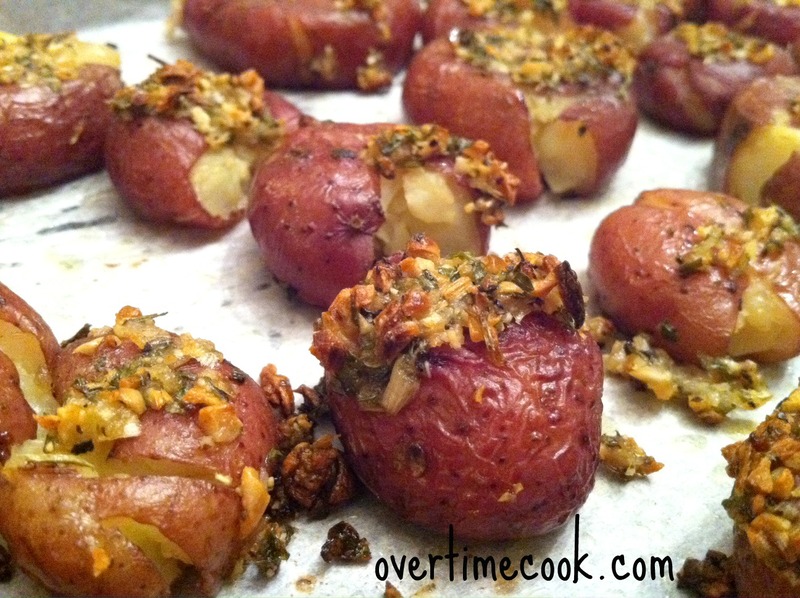 These little smashed potatoes look amazing!! Garlic is good with pretty much anything so I know these would be perfect for me 🙂 I am sure the bf would happy if I would make another potato side dish too, it’s like he can’t get enough potatoes! 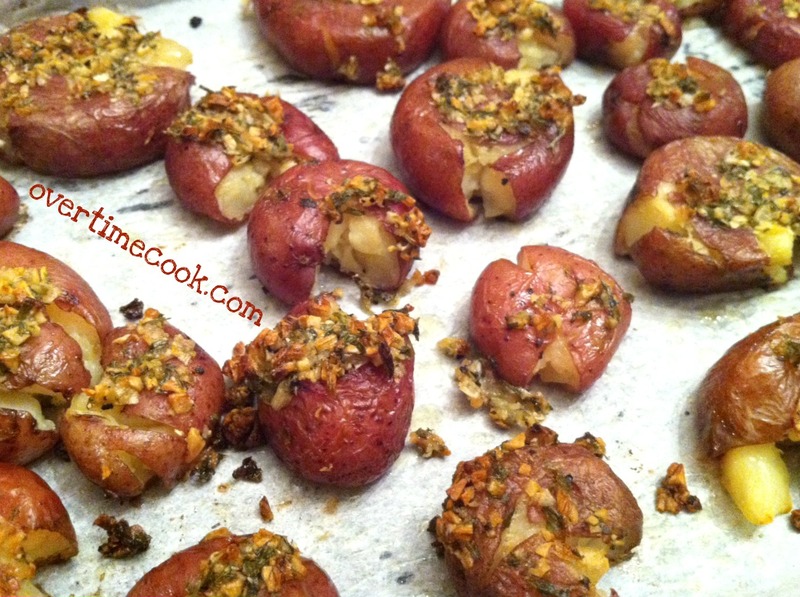 I love these smashed red potatoes and your additions sound absolutely wonderful and flavorful! As long as theyre mini potatoes it will be perfect! Can I use regular onions if I don’t have shallots? I have to peel potatoes on Pesach. Do you think I can still make these? They sound and look incredible! Boil large potatoes and peel them. Cut in cubes. Toss with the garlic/shallot mixture. Bake. You may need to adjust the baking time. (You can also bake cubes without boiling first for a more classic roasted potato. I am going to make these tomorrow and serve Friday night . Do you recommend rewarming in oven or warming drawer . I don’t wnat to ruin the texture . If oven what temp ? This sounds like a great recipe. I was wondering about something. There are so many wonderful recipes on Overtime Cook, so why isn’t there a recipe box that you can directly store the recipes in? That would be something very useful. Thank you! how do you think these will reheat? They reheat really well! Uncovered. Do you have any recommendations for making this ahead. Will it be alright served room temp? What do you think, I am thinking of bringing this dish to passover dinner but its a 45 min drive. Hmm Any suggestion? There were a huge hit. They were so tasty. Thank you for the recipe. I only issue was that my potatoes were various sizes, they were baby red bliss potatoes. The trick with smashing them with they tray worked for the bigger one but the smaller ones had to be smashed one at a time with the bottom of a plastic cup. I put my daughter to work on that( what are kids for?). My advice, try to get all the same size potatoes. No, roasted potatoes don’t freeze well.